Justice and the Omniscient Eye of God: Love is Blindness? The Great Gatsby (2013) Directed by:Baz Luhrmann. Writers Baz Luhrmann, Craig Pearce (screenplay), F. Scott Fitzgerald (based on the novel by). Stars:Leonardo DiCaprio, Joel Edgerton, Tobey Maguire, Carey Mulligan, Elizabeth Debicki. “The best [Christian] fiction is always written by the worst [Christians]. Not the saints in all their virtue—and especially not the heretics, who are willing to undo the whole of Christianity if only their vices can be redefined as secret virtues—but the sinners in all their sin are the ones who are able to create a genuine story.” F. Scott Fitzgerald is one of these, and The Great Gatsby contains Christian themes regardless of how much Fitzgerald wishes to get away from them, and because Baz Luhrmann has produced a film that is faithful to Fitzgerald’s text it too contains the same Christian themes. Perhaps the dominant Christian theme in The Great Gatsby is one of Divine Omniscience and justice in the face of moral decay. This theme is embodied in the giant billboard of the failed optometrist Dr. Eckleburg which stands watch over the sordid and tragic lives of the characters of this story; Luhrmann has successfully incorporated the unblinking eyes of Dr. Eckleburg into his film adaptation of the novel. The billboard’s watching eyes see through every secret, they discern hope and villainy, lies and truth in every character. They stand watch over the ashen cross roads between the extravagantly appointed homes of the rich and the bright electric lights of New York City. This ashen valley is full of the poor people who by their daily toil make the electric lights of the Jazz Age burn bright; it’s also the home of George and Myrtle Wilson, working class people, caught up in the lives of the films central characters. It’s important to note that Fitzgerald’s view of God, as portrayed by the “persistent stare” of Doctor Eckleburg’s billboard, is a cynical view at best. His growing antagonism toward his faith informs his writing and Fitzgerald on the surface presents this set of All-Seeing-Eyes as either unable to act or dispassionate to the human suffering before them. In the film this is more ambiguously presented, and Luhrmann utilizes this image of the billboard as witness to the unfolding events at key and pivotal points in the film. For all his scepticism about the existence of God, Fitzgerald wrote a story that deals with morality and justice that reaches past the material into the territory of the metaphysical: While on the surface the eyes that watch ‘seem’ unable to act, someone, somehow, and in some way still has to pay the price for sin. Again, because the director is so faithful to the text of the book these ideas are present in the film. The central character of the film is the mysterious Jay Gatsby (Leonardo DiCaprio) a man with enormous wealth and an enormous secret. It’s revealed through the course of the film that he has fallen in love with Daisy Buchanan (Carey Mulligan) who, with her husband Tom, lives across the bay from Gatsby in a posh affluent community outside of New York City. The Buchanan’s are rich and bored and they play fast and loose with their wedding vows. Daisy’s cousin, Nick Carraway (Tobey Maguire), is the narrator of the film and it is often through his eyes that the viewer is shown the lives of these individuals. The opening line of the film, as in the book, has Carraway say to the audience, “In my younger and more vulnerable years my father gave me some advice that I've been turning over in my mind ever since. ‘Whenever you feel like criticizing any one ... just remember that all the people in this world haven’t had the advantages that you’ve had.’” The Christian will hear the echo of Jesus’ words, “Judge not, and you will not be judged; condemn not, and you will not be condemned; forgive, and you will be forgiven;” Carraway is the most forgiving and least judgmental character in the film. Of all the characters Carraway most consistently puts the best construction on things,particularly on Gatsby. 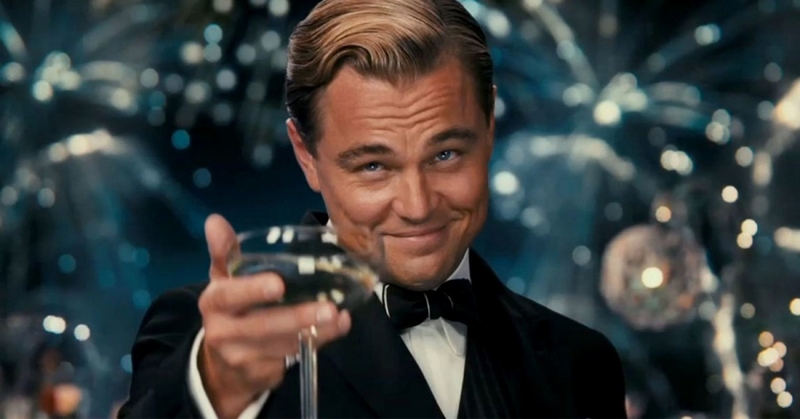 At one point, after some of the film's major plot points have unfolded, Carraway encourages Gatsby saying, "You're better than the lot of them." The film goer will of course know that this is not technically the case. Gatsby is just as guilty as the rest of the film's characters, his moral fibre is just as weak, yet Carraway feels obliged to defend Gatsby. Is Carraway wilfully turning a blind eye to Gatsby? Will the Omniscient eyes of Doctor Eckleburg’s billboard see the truth? In the end it is the viewer that is provided the full view of Gatsby. The Christian viewer may well consider that if Gatsby was more like king David from the Scriptures he’d have the added benefit of being righteous, but Gatsby isn’t righteous: His faith is not in God. Carraway says at the conclusion of the film that “Gatsby believed in the green light, the orgastic future that year by year recedes before us. It eluded us then, but that's no matter - tomorrow we will run faster, stretch out our arms farther... And one fine morning - So we beat on, boats against the current, borne back ceaselessly into the past.” Jay Gatsby is a character intent on solving his own problems and uses others to that end, he desperately wants to relive the past, to “repeat the past,” only repeat it perfectly on his own terms. The drama in the film exists between Gatsby’s desire to do this and his ability to do it. While The Great Gatsby successfully captures the look and feel of the roaring twenties, with all of its lush art deco material culture, it really shines in the telling of the story itself. On the one hand it’s presented as a romantic love story, while on the other hand it shows the consequences of becoming involved in adultery, lying and coveting. This is what makes the film into a tragedy, familiar territory for Luhrmann who has also dealt with tragic love in Romeo + Juliet (1996) and Moulin Rouge (2001). As in Moulin Rouge, Luhrmann has woven modern music into The Great Gatsby successfully placing modern music into a historical setting, even rerecording some music to make it sound as if it was originally recorded in the 1920s. U2’s tragic love song, Love is Blindness, is used to great effect both illustrating Daisy and Gatsby’s relationship while at the same time addressing Fitzgerald’s cynical view of Divine Omniscience: The song opens with the lyric, “Love is blindness I don’t want to see, won't you wrap the night around me, O my heart, love is blindness.” Luhrmann cleverly uses this song at just the moment when the unstoppable wheels of Justice begin to turn and people start to pay in earnest for their moral failings. This judgment is something Gatsby doesn’t want to see happen and as it starts to unfold he finds himself personally in denial of the serious nature of the judgment that is falling upon himself and others in the film. This judgment impacts the rich and the poor, from George and Myrtle Wilson right up to Jay Gatsby and Daisy Buchannan. As a Christian watching the film the cross of Christ may come to mind as this unstoppable judgment unfolds, because it is precisely in the midst of tragedy that someone, somehow, and in some way had to pay the price for sin, at the cross Jesus pays the price, His lifeless dead body hangs as a testament to that judgement. Here is where Fitzgerald has the most difficulty dodging his Christian faith; In the Great Gatsby justice is served, and the Omniscient eyes of Dr. Eckleburg do watch over the unfolding scene: In the film Luhrmann presents this in an unnerving almost fatalistic way, the Christian however need not be unnerved by the Omniscience of God in their daily lives; Jesus says “your heavenly Father knows [all] that you need.” While Fitzgerald struggles to see God as anything but inactive and dispassionate, in Christ Jesus the Christian knows God to be the just opposite, God’s love isn’t blindness. As a film The Great Gatsby is better paced than previous adaptations of the Fitzgerald’s book and Luhrmann does a masterful job retaining the complexity of the story while making the story accessible to modern viewers. With its PG-13 rating The Great Gatsby is not a film for younger viewers but for anyone who read the book in high school or in an English Lit class in college or university they will likely be pleasantly surprised at how well Luhrmann has translated this story to film, it has all the flash of a summer blockbuster while maintaining all the dramatic story telling of an Oscar award winning drama. “Gatsby's Epitaph: F. Scott Fitzgerald.” Jody Bottum, Catholic Dossier 5 no. 4 (July-August 1999). The Great Gatsby, F. Scott Fitzgerald, Arcturus 2013, pg 35-36. The Great Gatsby, Fitzgerald, pg 184.